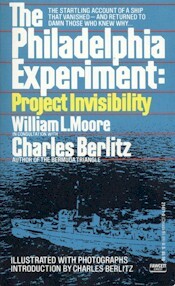 The Philadelphia Experiment: Project Invisibility. William Moore with Charles Berlitz describes a search for information about a secret wartime project. The experiments are believed to have been an attempt to attain RADAR invisibility for ships at sea using powerful electromagnetic fields. This book has recently come under scrutiny, legitimately bringing into question many of the statements made therein. Nevertheless, it is interesting to note the USS Eldridge was an electric powered vessel and that on occasion Tesla spoke of electric propulsion for warships, suggesting the on board generating capacity could be diverted to other uses. It is also known that some of the other destroyer escorts (DE) in service during the WWII era were equipped with three phase propulsion generators rated at 4,600 kva per propeller. Presumably generators of this size would be capable of supplying sufficient energy for high power pulsed field experiments.